Dream Green is a company in Weirton, WV, USA, selling several board games, including two chess variants: Noble Celts, and Tic Tac Check. 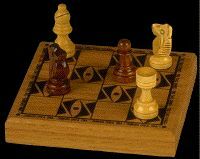 The company also planning to introduce a chess and game clock - for more information and a special offer, see their website. http://www.thebestbargains.com Dream Green Catalog: Noble Celts. http://www.thebestbargains.com Dream Green Catalog: Tic Tac Check. Please note that the game's name is Tic Tac CHEC (no K) and our website is now www.dreamgreen.org. Thanks.